Throughout the year, we are in pursuit of impressing our clients with the variety of work we do for them. So we spend that extra hour spent making a last minute project look spectacular and effortless. This holiday season should be no different. Why not take that extra bit of time and effort in sending your favorite or most important clients that perfect gift to really show them what they mean to you. It provides a sincere token of your appreciation for them, and also just makes you feel all warm and fuzzy inside. A win for everyone! This isn’t to say that you’d better start buying lottery tickets now to afford it! There are all sorts of fun and creative gift ideas out there that will do the trick without breaking the bank. So whatever your budget may be this year, however picky your clients may be, there is always something for everyone. So, unleash your creative side this year and wow your clients with one of these awesome gift ideas! Friendly disclaimer: Some of these gift ideas may also work for those office secret Santas or co-worker gift exchanges, as well as a little token of appreciation for your team members! We all receive loads of sweets and candy during this time of year. But to add a little extra touch to it, why not purchase something custom made with your client in mind? Not only will it serve for a yummy treat, but it shows that you put some extra thought into your gift. Check out Totally Chocolate! They have several pricing options, as well as options for flavor, shape, design, and/or message. 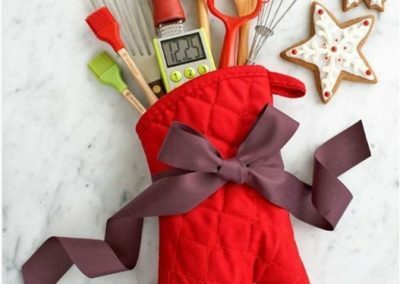 This not only serves as a fun and creative gift idea, but also something incredibly practical for everyday use. In today’s technology-driven world, having one of these guys handy at all times is almost a necessity. Needing a gift for that secret Santa gift exchange at the office, but chose the one person you know the least about? This is the perfect solution for that! So check out some of these sites that offer custom or funky designed USB drives for purchase. For character-inspired flash drives, Mimoco, or for everything else inspired, check out Custom USB. Because let’s face it: who DOESN’T want a USB drive in the shape of a robot? We all have that one person in our life. The one who is guaranteed to have every gadget, toy, device or new trendy item known to man. Sometimes it can seem nearly impossible to find the perfect gift for this person — because odds are they already have it. Don’t fret, we’ve found the perfect solution to your gifting dilemma! 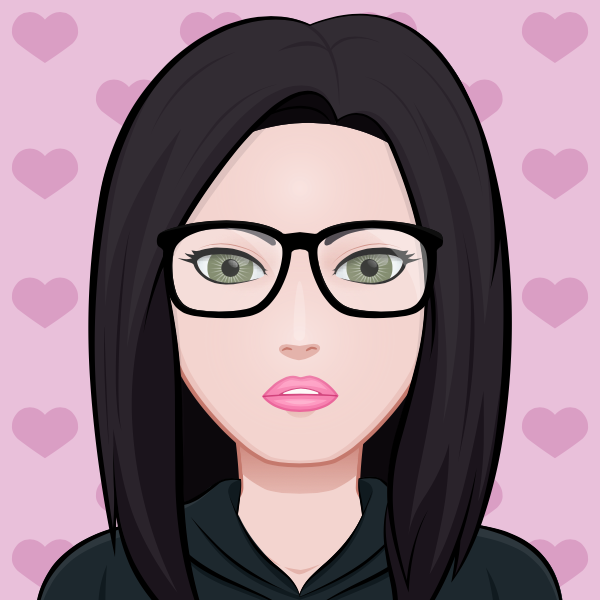 If you have an idea as to the likes and dislikes of this client or co-worker, check out Etsy! It’s a website consisting of strictly handmade and vintage items. Because of this, you’re sure to find something one-of-a-kind (and they also offer gift cards!). Not really your style? Also check out Uncommon Goods, or Quirky. Both names pretty much speak for themselves, as these companies provide unique, one-of-a-kind items for purchase, that will leave you thinking “Wow, what a cool idea!” They also break it down into categories such as “Smart Home”, “For Him”, “For Her”, or “Health Nut” to help you find just the perfect gift for anyone! 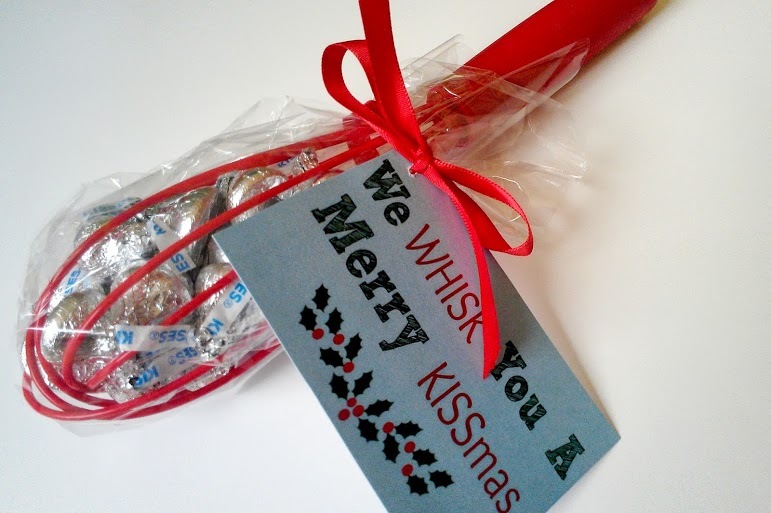 While this type of gift has been around for ages, we propose a fun spin on the idea! 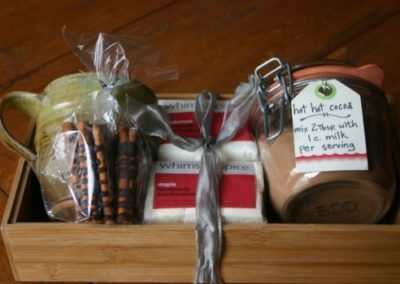 Instead of purchasing something generic and bland, spruce up any ordinary basket with some custom items that you know your client will love. 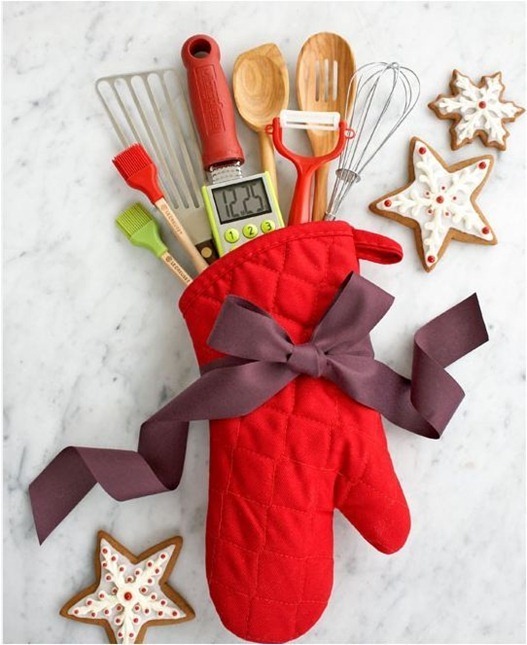 For the cooking fanatic, fill a festive holiday oven mitt with some kitchen essentials. For the golf pro you might fill their basket with some new golfing accessories. 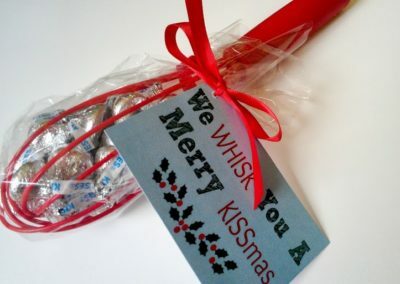 If your client loves wine, instead of just sending them a plain bottle, wrap it in a holiday hand towel tied with ribbon. 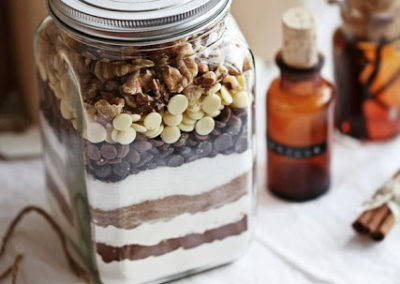 Another trend that is becoming a popular gifting idea are sweets in a jar. Fill an ordinary mason jar with some of your tasty homemade holiday cookies and add that extra touch with a custom company or holiday label, some festive ribbon and voila! 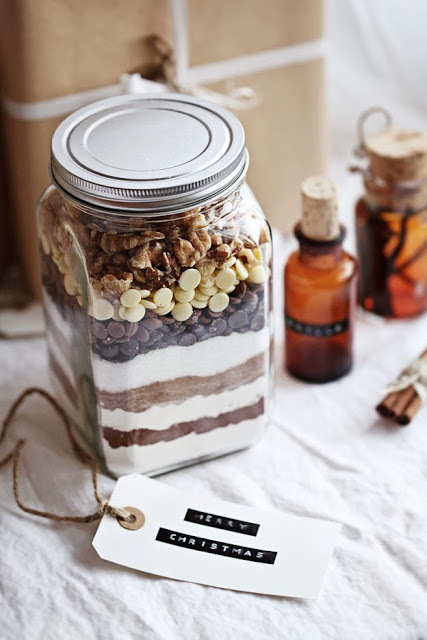 While this type of gift may seem to be the last resort or go to item if you’ve waited until the last minute, check out Papery and Cakery, who has provided a creative and fun way to gift a gift card! In closing, here are some things to keep in mind while contemplating the perfect gift for your favorite clients, co-workers or team! Keep in mind the cultural or religious affiliations of the person you are gifting, as they may not celebrate the same holiday that you do. Since dates of holidays differ, this becomes important if you need to deliver or ship the gift. You will also want to think about this if you’re just sending personalized greeting cards to clients as someone celebrating Hanukkah might find it a little offensive to receive a Merry Christmas card. Personalized gifts are great, but there is also such a thing as too personal. So, unless you know your client or co-worker very well things like alcoholic beverages, gift certificates for massages, or any kind of fragrance or health and beauty items may come off as a bit awkward. Keep the self branding to a minimum – you are giving a gift, not trying to sell them something. We suggest subtle uses such as designing your greeting cards or gift labels with your company colors. We do not suggest giving company promotional items such as T-shirts, pens, coffee mugs, etc. as gifts. There is no need to break the bank with holiday gifting, the meaning behind the gift can be worth more than the price tag. Keep in mind that some clients may take off the week of Christmas, so always try to get their gift delivered or shipped to arrive the week before Christmas.